This elegant ensemble is reminiscent of the style of Jackie Kennedy. The sleeveless gown and coat are made of a white and gold lame. 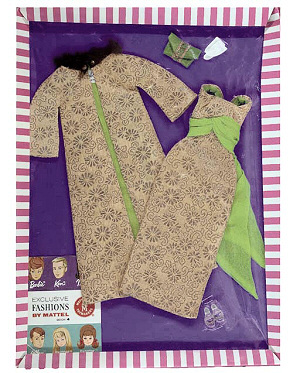 The coat has a fur collar and is lined in a green fabric that matches the sash. The green silk purse has gold braid trim and is very, very hard to find. This ensemble is very popular with collectors. It is hard to find and is very valuable!